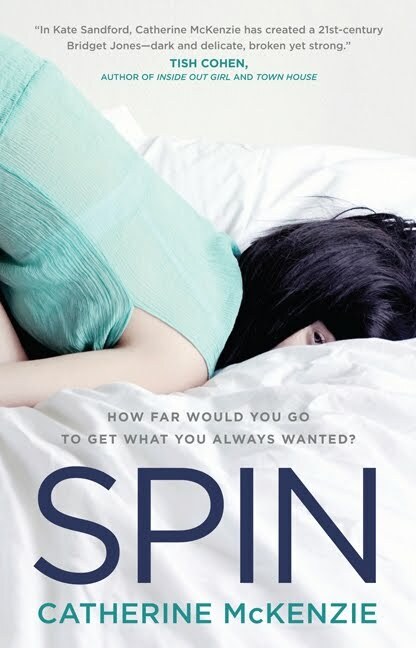 After falling in love with "Arranged" by Catherine McKenzie, I received an opportunity to review "Spin" and jumped on it! I had heard only good things about it and had a feeling I would enjoy it for that reason. This novel has definitely lived up to its "hype." Kate Sandford just lost her dream job working for a music magazine by showing up to the interview drunk from her 30th birthday celebration. Her behavior at the interview has instead made her the perfect candidate to follow the latest "It Girl" to rehab and report to a gossip magazine with an insider's viewpoint. If she is successful, she'll be able to get the music magazine job she wanted originally. However, Kate doesn't bank on the effect rehab will have on her own life, as well as what her dream opportunity will do to the friendships she has fostered, especially with this "It Girl." The last good book I read about rehab, prior to this one, was "Rachel's Holiday" by Marian Keyes. I think that if you liked that book, you will definitely like "Spin." The first thing that stuck out for me was all the pop culture references. I'm a huge pop culture "geek," so it was fun to see what Ms. McKenzie would come up with next. I love that she quoted one of my favorite lines from "The Princess Bride" and also talked about some Christopher Guest mockumentary films (oddly enough, he was also in TPB). At the end, she includes a playlist based on the songs mentioned in each chapter. Next was the realistic dialogue and a main character with whom it was extremely easy to relate and connect. The supporting characters were all unique and a lot of fun to read about. Saundra, the counselor at rehab, especially stuck out with her dog obsession. I also liked the romantic sub-plot and how the tension built up throughout the story. Come to think of it, there wasn't anything I didn't like! I highly suggest checking out "Spin" and making it a best seller, the way Ms. McKenzie strives to help other books become best sellers. In the meantime, thanks to Ms. McKenzie, I have one copy to give away to a lucky reader in the US or Canada. 1. Please tell us: What is the craziest thing you've ever done to get the job you wanted? 2. Please tell us: What is your favorite line from "The Princess Bride." US/Canada only. Giveaway ends Monday, February 7th at midnight EST. I have to be honest and say I have never had to do anything crazy to get a job. I am a fan on facebook and a follower of the blog. Craziest thing...when I was 15 I lied and said I was 16 in order to get a job at the PNE. I haven't done anything crazy to get a job. I have never had to do anything TOO crazy for a job. When asked if I knew how to run certain programs on the computer for my current job I acted like I did it all the time. I remember having to ask my cousin-in-law, who is a computer programmer, for some help before my first day so I wouldn't make a fool of myself. Fav quote from The Princess Bride: "Death cannot stop true love. All it can do is delay it for a while." The craziest thing I've done to get the job I wanted is to answer the phone and start scheduling meeting for my previous boss beginning at 4am PST, I was a contractor then, it did pay of as I am now a full time employee. Favorite line is, "As You Wish"
I am a follower, member and will tweet this. I have never done anything crazy to get a job I am happy to say! I am sorry to say I have no favorite quote from The Princess Bride. I posted book giveaway on Facebook! I tweeted book giveaway on Twitter! I wish I could say I did something crazy, but I haven't. Never did anything too crazy to get a job, but I do love The Princess Bride: "Inconceivable!" "you keep saying that word. I do not think it means what you think it means!" I follow the blog & on Facebook. I have never done anything crazy to get a job. Never thought to...too scared by the whole interview process. I have never done anything crazy to actually get a job. Well, actually, I may have done a snippet of "Tooty-Ta" once during an interview! I haven't really done anything "crazy" to get a job I wanted. One of my professors was the DA in Brooklyn and I took one of his classes and made sure to ride the elevator with him on the way to or from class O i could chat with him & make sure he knew me! Spin sounds like an interesting & fun book and I think Catherine McKenzie is an awesome person. Please enter me in your giveaway! "Bye, bye boys, have fun storming the castle!" I'm a fan on FB and follow this blog- thanks for the chance to win! I'm a BIG fan on FB and follow this blog- thanks for the chance to win! I have never seen the princess bride! have not really done anything too crazy to get a job? I have never seen the Princess Bride.But this is my fave quote "This is true love... you think this happens everyday?" I'm dying to read something by Catherine MacKenzie! Great giveaway. I follow you all on the Blog, FB and Twitter. One of my favorite lines from the Princess Bride is when the sick boy in bed, whose grandpa is reading him the story, says, "Is this a kissing book?" Probably the most cazy thing I've done to get a job, is nothing too-super-crazy but once I walked in a terrible snowstorm cause I didn't have a car but I really wanted a corporate job, so I walked to a bus then had to go into a public ladies bathroom to dry off my nice clothes and hair before my interview. Thankfully, I got the job and a car shortly after:) Please contact me at cgraceh@gmail.com if I win! I just posted a link to the giveaway on Twitter too!! 1. The craziest thing I've ever done to get the job I wanted was saying I had no problem being there for 8am... I am NOT a morning person. 3. I am already a follower of the blog. 5. I had already joined Chick Lit Central on Facebook. I am pretty boring and have to admit that I haven't done any crazy things to get a job. I don't have a fave line from The Princess Bride.